This petition has been created by jon z. and may not represent the views of the Avaaz community. The NDP have once again introduced a private member’s Bill C-291 aimed at bringing mandatory GMO labelling onto Canadian food shelves. We need to push harder than ever and make our voices heard. Agriculture critic Ruth Ellen Brosseau and Quebec MP Pierre-Luc Dusseault said Canadian consumers have a right to know what’s in their food. “The objective of my private member’s bill is very simple. It seeks to make genetically modified labelling mandatory in Canada,” Dusseault told reporters in French. “…Once adopted, it would be illegal to sell genetically modified food in Canada unless it is clearly labelled. 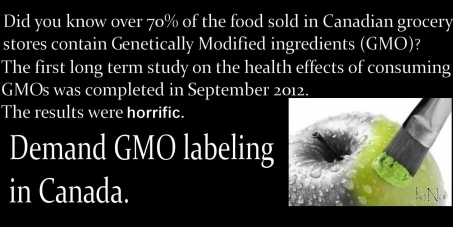 In Canada, there was previously private member's bill C-257 introduced by NDP to require mandatory GMO labelling RIGHT HERE IN THIS COUNTRY. Unfortunately it never passed to law. All Canadians should show support for this type of bill now and in the future if we are to see labeling of GMO ingredients in our food products.. Interest in this by political parties waned as did interest by the public just before Harper was defeated. It's time to renew interest in this with a bigger push than ever to the Trudeau Government. Thank You Very Much For Your Support and Shares.